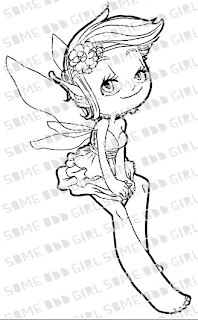 The last day of new fairy reveals are here. She is one of my favorites from the new release! to attach her directly to a card. Instead, we found a mushroom hidden away in the dark recesses of my scrap cave. With some new grass and moss added to the base of the mushroom, sweet Spunky Sprite had a new place to call her very own. 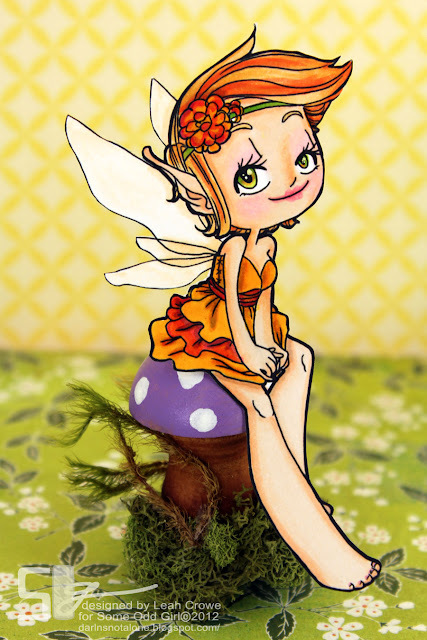 She is proudly displayed on my mantle right now with my Graphic45 fairies from last year. Please go check out my fellow DT members to see how they colored up this sweet lil sprite! So, which of the new fairies were your favorite? It's hard to choose just one isn't it? Don't forget to share your SOG creations to the Some Odd Girl Facebook Wall!! Our very first fan friday starts tomorrow, and it could be YOU featured! This is fantabulouslyfantastic!! Love LOVE how vibrant and real she looks Leah! STUNNING!!! Loveeee her!! She is ADORABLE! I love love love how you staged her on the mushroom!